The Elk Hotel dates from ca. 1925, always at this same location. In 1929 twin beds could be got for $12 (a week?). In 1930 owner-operator was Patrick Coen (1878-? ), an immigrant from Ireland in 1899. He appears in the U. S. Census of 1930 living at the hotel with his wife, Mary E. Coen, and their three children. 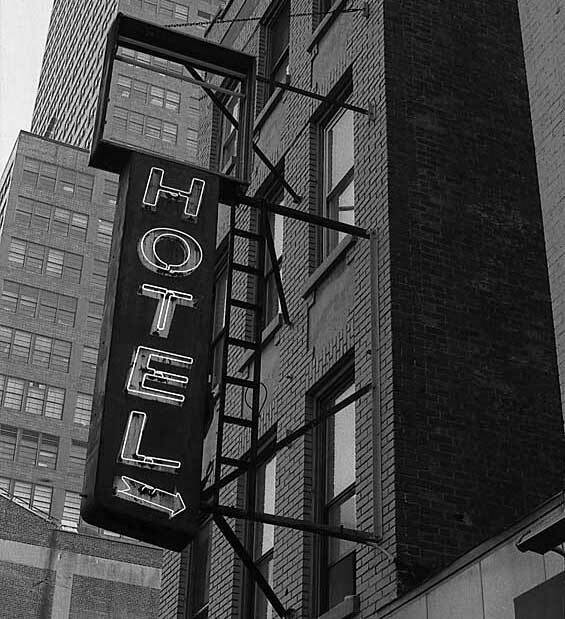 The hotel on this date had 45 guests (lodgers). Coen became a naturalized citizen 12 May 1904 having arrived in the U. S. 26 April 1899. In 1904 Coen gave his occupation as "Waiter." In 1918 Patrick Coen registered for the World War I draft while the proprietor of a saloon at 600 9th Ave. This would have been located nearby on the east side of 9th Ave. between 42nd St. and 43rd St. The saloon was located at 600 9th Ave. from approx. 1910 to 1924. In 1941 notice appeared in the New York Times (4 Nov. 1941, p. 18) that the proprietor of the Elk Hotel, Harry Edfried, 46, had been charged with "failure to keep and file with the Board of Elections a register of roomers." In 1942 Nicholas Hess (1878-1966) became either owner or manager of the Elk Hotel. For more on Hess see his story in the entry for the Penn View Hotel on 34th St.
From 1947 to 1969 there was a Sardi's Restaurant located at 360 W. 42nd St., but this was not the show-biz Sardi's run by Vincent Sardi (1885-1969). This began as Sardi & Cianciotta in 1947 and became Giuseppe Sardi in 1950.